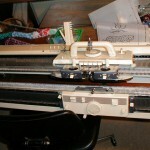 The Ultimate Sweater Machine was my first knitting machine, and I loved using it. Although it was not quite as fancy as my Mom’s Professional Empisal Knitting Machine was at the time, it did the job and it did it well. It was a time when I was relocating cities, and I was in between jobs. I would knit on my Ultimate Sweater Machine day in and day out and produced the most amazing baby clothes, that I sold virtually as I turned them out. I found the knitting process relaxing and creative, and would get quite frustrated if I found I couldn’t get to my machine on a particular day. Researching how the Ultimate Sweater Machine had upgraded over the years, I see it still has the same overall look to it, with a few upgraded features. There are both negative and positive reviews, and there is a learning curve, but all in all I found the machine simple to use. If you want to find out more about the Ultimate Sweater Machine and where you can order it, simply click on the link below or even on the picture. 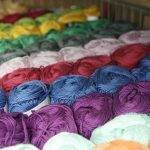 Yarn can be used right from the skein saving you loads of time. Includes knitting machine, deluxe kit, sweater extension kit, row counter and intarsia plate, which is more than I got with my older version all those years ago. Knit as many as 1200 stitches per minute (this has also improved). Make cables, lace, picture knits, tuck stitch, Fair Isle and more. You can learn how to use the Ultimate Sweater Machine really quickly. This set includes the Knitting Machine, deluxe kit: the sweater extension kit, row counter, and intarsia plate. The machine has 100 needles on the bed. With this machine, you can make it all including cables, lace, picture knits, tuck stitch Fair Isle and many more fancy stitches with professional looking results. An instructional DVD is also included so you can see the machine in action. An instructional DVD is also included so you can see the machine in action. The Ultimate Sweater Machine is constructed of plastic and steel and made in the U.S.A. Note: These machines need to be set-up on a flat level surface. If the item is not leveled it will not function properly. FAQ’s and instructions can be found on the manufacturer’s website and also their toll-free customer service line which can be found on the items packaging and the included instructions. You can use any weight of yarn with this system, but with a very thick yarn you will need to go a bit slower with your knitting. You do get different plates with the kit that will adjust your stitches to the level of your yarn thickness. 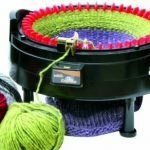 All in all the Ultimate Sweater Machine is a great little knitting machine to get started on, but some people have found some difficulty setting the machine up, and have found it a bit finicky to learn to use in the beginning. If you want to knit for profit, then I highly recommend eventually upgrading to a professional knitting machine or the addi Knitting Machine, which I believe is the better buy at the moment.